Vehicular emergencies are inconvenient, but they can be especially frustrating when you’re not prepared for them. Jim’s Auto Clinic, a leading auto repair shop in Cincinnati, OH, lists some of the essential items you need to have in your emergency kit. Whether they enable you to call for help, fix minor problems, or stay comfortable while waiting for roadside assistance, they will all come in handy when your car breaks down, or you get into an accident. Your mobile phone is useless if it’s drained. Since the first thing you have to do in case of a breakdown is get in touch with a towing company—or call 911, if it’s an emergency—you need to ensure that it has enough charge to complete the call and maintain an open line of communication. Minor scrapes and bruises caused by car accidents can be easily remedied if you have a first-aid kit. Items you should put in this bag include rubbing alcohol, bandages, painkillers, antiseptic ointments or creams, and any prescription medicine you might personally need. 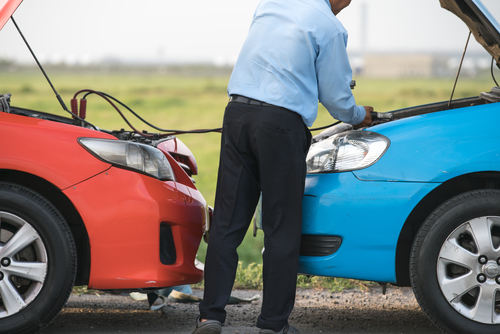 If your car won’t start, and you either don’t have access to towing service, or you don’t want to spend on roadside assistance, you can ask a friendly motorist to give your car a boost using jumper cables. Just make sure that you know how to use them. Getting stranded in a remote area often means that help won’t get to you anytime soon. Having something to snack on and drink while you wait is critical. Bring non-perishable food such as crackers or easy-to-open canned goods along with a couple bottles of drinking water. If your vehicle won’t run, and if there are no establishments nearby where you can take shelter, you will need a heavy blanket to keep yourself comfortable. Bear in mind that nights in Ohio can get quite chilly even during summer, so it’s best to stay prepared. When your car breaks down in the middle of the night, you need a flashlight to help you perform minor troubleshooting, such as checking the engine for obvious issues. It also allows you to walk in the dark while you search for an auto repair shop nearby. Bring one that is rated for Class B fires, which involve combustible or flammable liquids such as fuel, and Class C fires, which are electrical in nature. Put it somewhere that’s easily accessible, such as under the driver’s seat. These are just some of the items you should have in your vehicle’s emergency kit. If you need to have your car repaired after it breaks down, bring it to Jim’s Auto Clinic. This auto repair company specializes in oil changes, drivability issues, computerized engine analysis, and brake service. Call (513) 662-6696 for inquiries, or check out their website for more information. What Makes Winter Auto Maintenance So Important?